Christmas is a time to enjoy home and hearth, but it's also a wonderful time to enjoy going out and getting in the holiday spirit, especially if you're traveling to somewhere like Salt Lake City in November or December. Whether you just want to look at Christmas lights, catch a holiday theatrical or music performance, or want to go on a one-of-a-kind adventure in a winter wonderland covered in snow, Salt Lake City has an event for you and your family this Christmas season. We've selected the best holiday events happening this year in Salt Lake City below, but remember that although this list is up-to-date, it's best to call the venue or visit the official website of each event to get the most current details before attending any event. 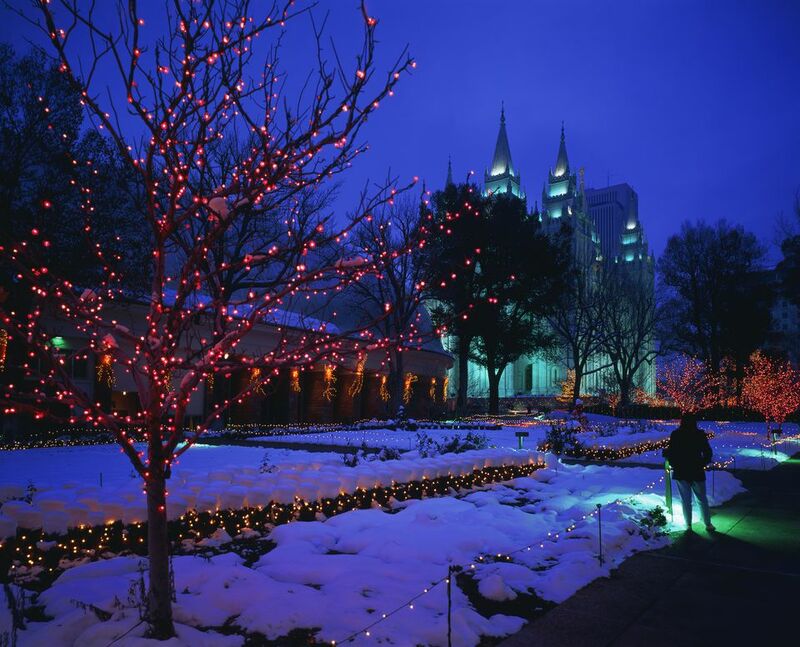 Temple Square is one of the best places to see Christmas lights and has one of the best Christmas concert series in the city, culminating in the Mormon Tabernacle Choir's Christmas Concerts on December 13 through 15 at the Conference Center Auditorium. Christmas concerts take place from in the Joseph Smith Memorial Building featuring a variety of local choirs coming together for mini Christmas concerts. Concerts are scheduled November 24 through December 22, 2018 (Monday through Saturday) at 1:00, 2:00, 3:00, 4:00, and 5:00 pm. You can also head over to the Assembly Hall or the North Visitor's Center for evening concerts—which also features local talent during the same dates. Additionally, thirty-minute organ recitals are given in the Tabernacle Monday through Saturday at 12:00 noon and Sundays at 2:00 p.m. Performances are by the Tabernacle organists and guest organists. From November 8 through January 5, 2019, the Desert Star presents, How the Grouch Stole Christmas. While you are not required to purchase dinner, pizza, burgers, and desserts are available. Children over 3 years old are permitted. The theater recommends that children be 5 or over to enjoy the performance. Known for its off-the-wall holiday hits and dinner-theatre style performances, Desert Star in Murray is a great destination for some holiday cheer if you're staying in SLC this Christmas season. Heber Valley Railroad's North Pole Express features a historic train ride through the beautiful Heber Valley, plus cookies, hot cocoa, and a visit with Santa, and it's quickly become a favorite holiday tradition for many Utah families. Running daily except for Sundays from November 20 through December 22, trains depart at various times throughout the day—check the website for times and availability. The Off-Broadway Theatre is putting on a new spin on the Dicken's classic. The production called "A Muffet's Christmas Carol" will run from November 16 through December 29, 2018, and features life-sized puppets with Little Miss Muffet telling the story. It's a light-hearted comedy suitable for the whole family. Continue to 5 of 27 below. Thanksgiving Point becomes "holiday central" with a series of holiday events throughout the months of November and December, starting off with highly popular Luminaria light show at the Ashton Gardens, which runs November 19, 2018, through January 5, 2019. A special "Breakfast With Santa" featuring games and visits from Mr. and Mrs. Claus and other North Pole characters takes place on December 1, 8, 15, and 22, 2018. The Utah Symphony hosts a variety of holiday-themed shows throughout the month of December at the Abravanel Concert Hal in Salt Lake City. This year's line-up includes Harry Potter and the Prisoner of Azkaban in Concert, Bach's Brandenburg Concertos 3 & 4, Celtic Woman's The Best of Christmas Tour, Joy to the World with Pink Martini, and the Here Comes Santa Claus holiday program. More than 90,000 people visit the Festival of Trees each year to see over 1,000 imaginatively decorated Christmas trees, wreaths, centerpieces, gingerbread creations, playhouses, and quilts, which are auctioned to raise funds for Primary Children's Medical Center. In addition, the festival provides activities for children and entertainment for the entire family. From November 28 through December 1, 2018, at the Mountain America Expo Center in Sandy, Utah with leftovers from the auction available for purchase throughout the month. The Brigham Young University dance department's popular annual Christmas Around the World revue features a cast of more than 200 dancers, singers, and musicians presenting the dance traditions of different cultures united by the message of peace on earth. The show is presented on November 30, 2018. Continue to 9 of 27 below. Ring in the holidays with Willam Christensen’s beloved production of The Nutcracker. Set to Tchaikovsky’s famous score, The Nutcracker‘s dazzling blend of costumes, sets, and choreography creates an enchanted storybook world that has captivated Utah audiences for more than 50 years. Dates run from December 14 through December 29, 2018 with a variety of evening and matinee performances at the Capitol Theatre. Enjoy one-on-one time with Jolly Old Saint Nick over a warm, tasty breakfast, along with holiday crafts and play time at the Discovery Gateway, Salt Lake's popular children's museum. Breakfasts take place on Saturday, December 8 and Saturday, December 15, 2018, and tickets are required in advance to attend. Proceeds from ticket sales go to support keeping the museum's events program running. This year’s KUTV Holiday Pops Concert featuring the Choral Arts Society of Utah and West Valley Symphony takes place on Saturday, December 8, 2018, at 7:30 p.m. and will benefit the 2News Salvation Army Angel Tree Program. This event takes place at the Cottonwood High School Auditorium in East Murray, Utah and requires advanced tickets to attend. Red Butte Garden's 17th annual open house event features local handmade gifts for sale, free cider and hot chocolate, and acres of winter garden to explore on Saturday and Sunday, December 1 and 2 from 10 a.m. to 5 p.m.
Continue to 13 of 27 below. Each year, the Salt Lake Community College's Grand Theatre celebrates the holidays with several special performances and shows, and in 2018 it's bringing two holiday favorites to the stage for one magical night of operetta storytelling: Amahl and the Night Visitors & A Christmas Carol November 29 through December 1, 2018. This lively and festive concert is a crowd-pleaser sure to get all of your friends and family in the spirit. Holiday classics and some lesser-known pieces are featured in their annual Holiday Celebration Concert, which takes place this year on Sunday, December 9, 2018, at 7:30 p.m. at Hillside Middle School. Admission is free. At This is the Place Heritage Park, visitors can stroll through a pioneer village decorated like a Currier & Ives card, enjoy a visit with Father Christmas, see live reindeer, witness a live Nativity scene, listen to the Heritage Village Carolers, make crafts and homemade decorations, and shop for unique gifts. Special events occur nightly, excluding Sundays, from December 7 through 22, 2018. Continue to 17 of 27 below. The Dickens Festival is an arts and crafts fair in the recreated atmosphere of Old London. Shop for unique gifts while enjoying carols, entertainers, mini-productions of Scrooge and Oliver Twist, and a visit with Father Christmas. Events this year run 10 a.m. to 9 p.m. December 6 through 8, 2018 at the South Towne Exposition Center in Sandy, Utah. Each year, Michael McLean presents The Forgotten Carols, the story of a nurse caring for an elderly patient who warms her heart by reminding her of long-forgotten Christmas carols with a touring company. This year, the company stops in multiple locations in Utah, Idaho, and Arizona for performances scheduled on dates from November 20, 2018, through December 22, 2018. The Salt Lake Men’s Choir is excited to present Remembering Decembers with performances at the First Baptist Church in Salt Lake City on December 7 - 9, 2018 and a performance in Park City at St. Luke’s Episcopal Church on December 10, 2018. This is a family-friendly event with music from many genres. In SLC, the First Baptist Church pipe organ will accompany the choir for some selections as well as a live orchestra. Local favorite Peter Breinholt has been selling out theaters with his self-styled acoustic music for more than a decade, and his Christmas concerts have been a tradition since 2003. He will be performing songs from his Christmas album as well as favorite original songs with his four-piece band and string section. Performances take place in 2018 on December 21 and 22 at the Jeanné Wagner Theatre in Salt Lake City. Continue to 21 of 27 below. If you're tired of seeing The Nutcracker, check out the Odyssey Dance Theatre's productions of The ReduxNut-Cracker throughout the SLC region on select dates December 12 through 22, 2018. Get ready for a present-day life twist of the original Tchaikovsky score, re-imagined and arranged in a pop/hip-hop style. On December 17, 2018, the Larry H. Miller Family and Robert C. Bowden will present the 35th annual Christmas Carole Sing-Along featuring One Voice Children's Choir and the West Valley Symphony of Utah. Experience the sights and sounds of the season, where guests will receive a special gift package including a holiday treat while supplies last. The Cathedral Choir's annual Christmas Carol Services feature music of the Advent and Christmas seasons, including plainchant, choral works, and traditional carols. Scheduled will be Family Holiday Ornament Making followed by caroling with the Choristers of the Madeleine Choir School and a story from Saint Nicholas on December 6, 2018. Christmas carol services will held in December on selected dates. Performed December 4 - 9, 2018, Finding Neverland, based on the AcademyAward-winning film, tells the Peter Pan story with a twist as a Broadway musical. It is the winner of Broadway.com's Audience Choice Award for Best Musical. Continue to 25 of 27 below. Holiday light displays are an indispensable part of the season, and Salt Lake City comes alive with these colorful lights during the holiday season. No matter if you're visiting around Thanksgiving or even New Years Eve, you'll have a chance to check out some of the great displays in SLC. You can even ride the Jingle Bus from area to area in Downtown to see the lights and decorated store windows. The bus runs Friday, November 23 through December 31, 2018, in the evenings (except Christmas). Most of us dig deep into our pockets during the holiday season—for gifts, dining out, and entertainment—but holiday cheer doesn't have to be expensive. There are lots of free holiday events and activities in the Salt Lake area that will bring joy to the season without breaking the bank. Some fun and free events on our list include Friday Winter Walk nights at The Gateway, touring the decorated Governor's mansion, and enjoying the holiday market at the Utah Museum of Fine Arts. If you're over the holidays or, realistically, it's past Christmas Day and you've found yourself in Salt Lake City for New Year's Eve, there's a ton of fun things to do during the day and to ring in 2019. With torchlight ski processions in Park City and festive events in Salt Lake City, there will be plenty to do for New Year's Eve.